Over the past decade, Volkswagen has made its presence felt in India by introducing its wide range of class-apart vehicles. Volkswagen till now had only one SUV in its Indian garage. Volkswagen has the biggest empire in the automobile industry with the most exquisite brands in its kitty including Bugatti, Lamborghini, Bentley, etc and this makes it as the leading automobile manufacturers in its league of cars. Volkswagen is planning to launch the revamped model of Touareg in the Indian subcontinent this year and aims to generate a wide response amongst Volkswagen enthusiasts here. 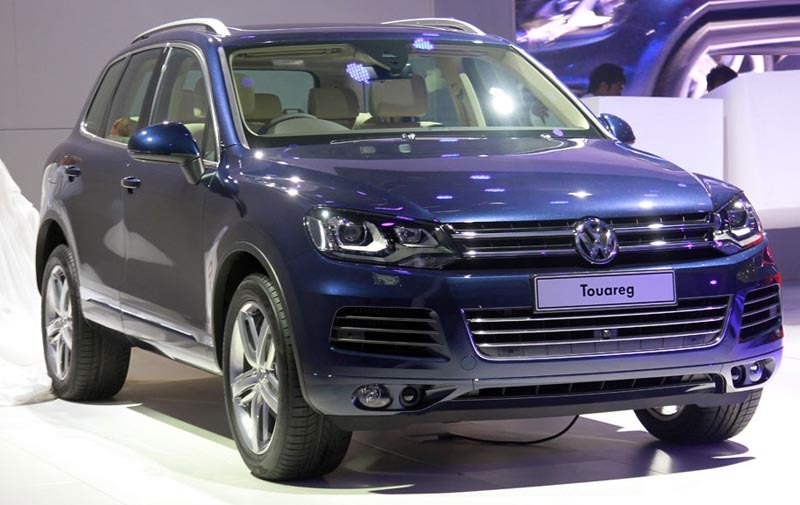 Volkswagen has given the statement that the new Touareg will make its way on the Indian roads by the end of this year. Volkswagen Touareg has been revered as the most promising SUV by the company and has already been appreciated worldwide and now Volkswagen, by bringing the all new Touareg to India plans to establish a stronghold over the most thriving automobile industry of the world. The new Volkswagen Touareg will be locking horns with the Audi Q7 Crossover SUV and the competition between the two cars has always been fierce over the past decade. Last year Maruti Suzuki and Honda fell due to natural disasters striking Thailand and Japan. The design of Volkswagen Touareg is first-rate and appreciable. This mean machine is a five-seater SUV and the new version of Touareg will be ergonomically stronger than its predecessor model. The car boasts of an all-terrain 4-motion system which is powered by a set of microprocessors continuously operating. The microprocessor technology pushes Volkswagen ahead of its counterparts as Volkswagen has always been introducing groundbreaking technologies in its automobile variants. There are many other eye-catching and commendable features the 4-motion all-terrain system of Volkswagen Touareg 2012 comes with. One of them is the hill descent control facility. This feature helps the car to maintain balance while tackling gravity. It has limited slip differentials attached to it and along with that there are electronic differential locks which have an off road button facility with them. 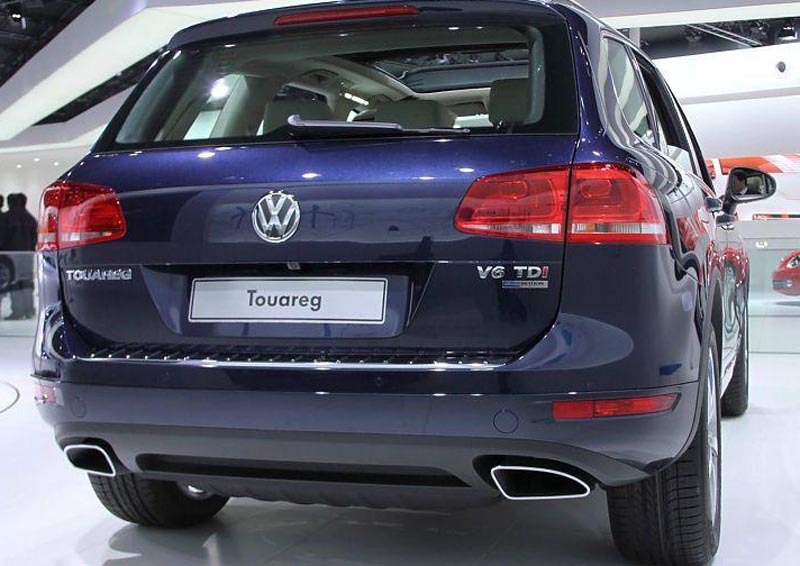 Volkswagen Touareg 2012 will be powered by a 3L Dynamic V6 Turbo diesel engine giving a maximum possible power of 240 bhp and the adjoining maximum torque of 440 Nm. The transmission control system attached to the car is an 8-speed tiptronic power speed transmission. This time Volkswagen has tried its level best to decrease the weight of the all new Touareg 2012 and have succeeded in making it an impressive 200 Kilograms lighter than that of its antecedent model. The 8-speed tiptronic transmission has been installed in order to enhance the fuel efficiency of the car by a considerable amount. From the safety point of view Volkswagen has installed 8 airbags in Touareg 2012 along with anti brake-locking system attached to the car. Volkswagen Touareg comes with 18-inch alloy wheels which give the car a sportier finishing and along with this they have Xenon head-lamps, panoramic sunroof and LED daytime running lights to enhance the appeal of the car.